The Netherlands is one of the top vacation destinations to which Germans love going every year and at first I didn’t get why so periodically. I always thought of Holland as a beautiful country, the type you go a few times to explore its main cities, enjoy the roads in between them, visit the beautiful colorful tulip fields, to name a few examples. I never thought it was a great destination for boating and sailing. I was aware about the popular canals of Amsterdam (as well as of the other main Dutch cities) surrounded by colorful houses and infinite bikes, but little did I know these waterways are spread throughout the country. Interesting fact is, the Netherlands has a rich nautical heritage. As a significant part of their land is below sea level, the Dutch neighbors have faced for centuries an excess water problem which led them to have nowadays thousands of kilometers of navigable waterways. The Netherlands has so much water, it has to be distributed above highways. Many neighbor tourists spend their family vacations navigating through these canals for a week or more while visiting the different cities and towns throughout the way. You would think whoever can afford doing such a thing has a fancy lifestyle, but not really. This is just what normal European families do, isn’t that ridiculous? Last fall I had the opportunity to enjoy this particular adventure for the first time with amazing people. We went to the northern region of the Netherlands, Friesland, where we rented a cozy motorboat and navigated for a week through towns and cities like Akkrum, Workum, Grouw, and the beautiful city of Leeuwarden, to name a few. Additionally, I found new experiences in small things. I crossed sleeping, bathing (and etc. ), and cooking in a boat out of my unexpected bucket list. I even got to drive the boat and was the captain for a while. I was feeling on fire! Me about to cook in a boat’s kitchen for the first time in life. Me being allowed to take the wheel through a lake where no accident is possible and pretend to be the captain. It was a week filled with traquility, away from city noises, where reading a book while hearing the calming sounds of the water against the boat and enjoying a 360 view of islands, towns and windmills was the busiest I could get. It was the perfect kind of escape I needed back then (caring for three little blonde German monsters). Navigating through the Dutch canals doesn’t require a license if you use a boat with limited speed and size, so it’s not an activity only for experts. However, it’s also not an activity for those completely unexperienced. Make sure you go with someone who has at least once or twice driven (and parked) a boat. Driving a boat is not that hard, you just have to learn the speed with which the boat reacts when turning left and right. The most nerve-breaking but exciting thing I had to go through was paying toll at the bridges, a.k.a. bruggeld. 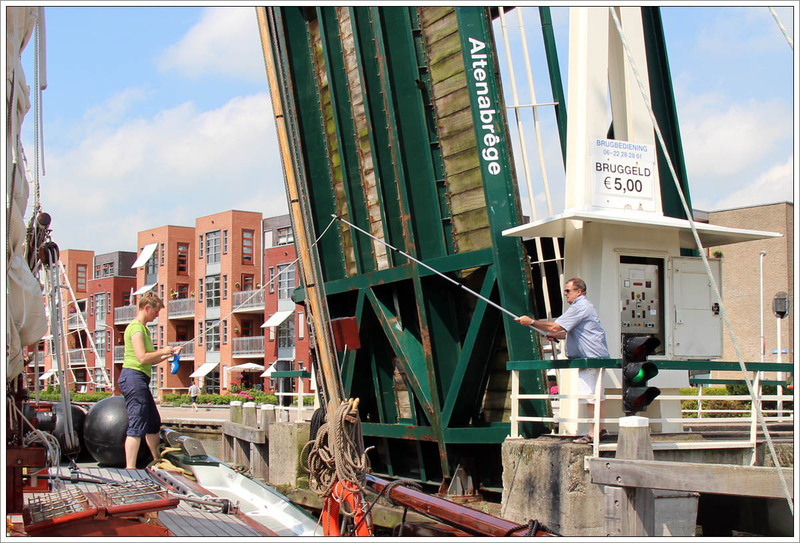 The bridge officer passes you a wooden clog with a fishing cane, in which you have to deposite the toll price in coins, and swing it back to the officer, all this while the boat is passing though the bridge and you are holding yourself on the edge of the boat from falling into the water. The adrenaline is real. But the fun and interesting part was obviously not limited to navigating. We drew our route on the map and visited a few towns and cities along the way. Our stay at each place may have not lasted long, but it was enough to admire the essence of Dutch modern and old architecture. Many Dutch towns showed a similar pattern of brick houses with piculiar roofs facing the canals, bridges every few meters, cobblestone floors wherever you’d go, and a windmill and canons at the exit/entrance of each town. Simply beautiful. But what I found most amusing was seeing neighborhoods with a small canal as their backyard, where each house owned at least a small motorboat with their own parking spot. A dream. The Dutch neighbors do know how to lead a relaxing vacation and add charm to your travels. They can transport you back in time through their middle-age looking towns, decorated by gorgeous windmills, canons, and ports filled with old-style sailboats, making you feel like being in a former sailor/pirate world or even make you wonder whether The Legend of Zelda: The Wind Waker setting was inspired from the Netherlands. Excuse the two mature adults inspecting the canon. Navigating through the Dutch canals was indeed something I would definitely repeat, preferably late summer or early fall, though. Such an experience is the kind of relaxing escape from a busy life I would recommend to anyone. We’re going to Friesland in June 2018 and I just love your blog. Awesome photos and you captured the essence of the experience. Nicely done, and thanks for sharing. Hi John 🙂 Thanks a lot for your kind words, I am glad you like it. I relate navigating through Friesland with mindful meditation, something the mind needs to escape the stress from every-day life. I loved my time in Friesland and will go back in August, which I’m so excited about. I hope you have a lot of fun and a relaxing time there! We’re going to Friesland in a few weeks (August 2018) and your blog is a wonderful source for inspiration. Can you recommend a travel map for understanding the various trip options and planning? Well, it depends what exactly you are planning to do. Do you want to sail/navigate through the canals or go town-hopping by car? We used a map for sailing routes since our only transportation through Friesland was a motorboat, but the map was very complete and also gave relevant information about the cities and small towns. I would definitely recommend this map, it was easy to understand (and I am a total beginner with this topic) and actually very interesting. You can easily request one of these maps at a boat rental.